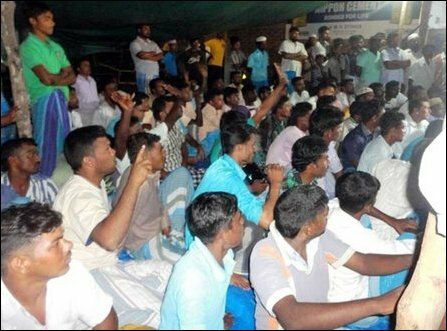 The SL government officials deny the accusation of the protesting fishermen. Deputy Director of Department of Fisheries and Aquatic Resources in Mulllaiththeevu, Jeyarasasingam Suthaharan told media that the officials were instructed to act only against those who were using illegal tools in fishing. Sinhala fishermen living in Kokku’laay, Ka’lappai and the intruding fishermen from South are the ones who were practicing illegal methods in exploiting the fishing resources at Kokku’laay lagoon, the Muslim fishermen say. Mr Ismail Seybudeen, the chairman of the central cooperative of fisheries development in Pulmoaddai said the fishermen were used to stake net fishing for more than 50 years and that the officials have banned this form of fishing 3 months ago and were selective in implementing the ban against Muslim fishermen. In the meantime, Tamil fishermen in Pu’liyamunai also complain that their fishing equipment worth of 1 million rupees were destroyed by unidentified men on 23 January. The chairman of Kokku’laay fisheries society Mr Francis Gonsal Ludman has complained on the problems being faced by the Tamil fishermen to the Northern Provincial Council (NPC) and the Councillor Thurairasa Ravikaran visited the place inspecting the damage caused to the fishermen.